Help patients make the transition from hospital to home with Vivo 40, a flexible, advanced, and clinically reliable respiratory solution from Breas. 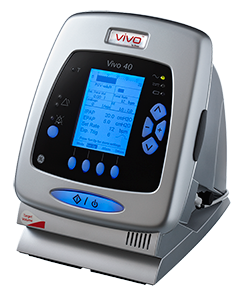 Vivo 40 provides both invasive and non-invasive respiratory support in PSV, PCV and CPAP mode to adult patients. Thanks to eSync, highly responsive Trigger technology, Vivo 40 synchronizes smoothly with the patient’s breathing effort. As the patient demands for a new breath, Vivo 40 responds immediately and delivers the pressure required. The Enhanced Pressure Support mode gives clinical flexibility when needed, and a maximum pressure of 40 cmH2O offers the ability to treat difficult restrictive conditions. Maximal Inspiratory Time: 0.3 to 3.0 s, Off.